Putting together the clothing exhibit “Form & Function of Fashion: The Way We Wore,” now showing at the Kelley House Museum through March 18th, I was able to learn a lot about things I typically don’t think too much about. For instance, our lovely women’s hats, gloves and fans were once viewed as absolutely essential if you were to be considered fully dressed. None of these items are found in my closet. One item that hasn’t dropped off the “must-have” list is a pair of shoes. Scientists have found well-preserved footwear dating to 40,000 years ago. Whether we wrapped our cold toes with furry moccasins, or let our toes hang out with sandals in warmer climates, it’s been a good idea for a long time to be shod. The history of shoe-making is a long and interesting story and there are plenty of places online and elsewhere to read about it. By the time Mendocino was being settled by northern Europeans in the latter half of the 1800s, shoes had transitioned from hand-made to factory-made. This was the result of new technology in sewing machines and other more specialized equipment that allowed individual shoemakers to make hundreds of shoes per day, rather than only a few dozen as before. These large scale shoe manufacturers sold their products to merchants all over the world, including those on the remote coast of northern California. Owners of our early general merchandise stores would have placed their orders for the latest styles, and upon their arrival, the crated cargo would be hoisted up to the top of the bluffs where we now watch for spouting whales. Among the places in early Mendocino that advertised boots and shoes for sale were Stauer’s Store (now Good Life Bakery) and Mendosa’s on Lansing Street, as well as several merchants on Main, including both of William Kelley’s stores, Brown & Gray, Everson’s, John D. Murray’s, Eugene Brown, and Antone Luiz’s The Toggery. The bay-windowed, two-story building on the corner of Kasten and Main Street was the location of several general merchandising businesses under various owners and names from 1878 until 1965. (It is now Gallery Bookstore — no shoes). One of those general stores was Jarvis and Nichols, in business from 1879 to1916. 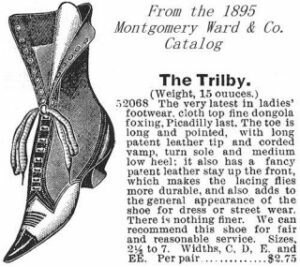 Around 1900 they ran advertisements for several years in the Mendocino Beacon newspaper featuring drawings of “The Trilby Shoe.” Although the word trilby is now synonymous with hats, trilby was a colloquialism back then for a foot, after Trilby O’Ferrall, the heroine of a wildly popular novel, whose feet were objects of admiration by all who knew and loved her. George du Maurier’s book was adapted to the stage (and later movies) and in one production the actress playing Trilby wore a distinctive short-brimmed hat that became a fashionable menswear item, worn in more recent times by Leonard Cohen, the Blues Brothers, and post-war British spies. Whether you were a fashion-conscious Mendocino lady with a broken Trilby heel or a mill worker needing his high-topped, double-soled boots repaired, there was always work for the early cobblers and shoemakers in town. We’ve been able to “cobble together” surprisingly few names from various business directories dating from 1867 up to 2000. The earliest were L. Johnson and Peter Hanson from 1867 and 1877. G.F. Wells was on Ukiah Street in 1877 across from the Lisbon Hotel. J. L. Dillingham and J.P.L. Janson are listed in the 1884-85 directory, and Patrick Lynch and Peter Hanson (still in business) are mentioned in 1888. S. Wilderspin was the shoemaker in1920 and possibly to at least 1929. After that, one presumably had to travel to Fort Bragg for shoe repairs and custom footwear until 2000 when Jason Clapp and Paul Shulman operated for several years Shoe String Cobbler, a custom shoemaking shop on Calpella Street between Ford and Lansing. Jason opened a proper shoe repair shop, Mendocino Shoeworks, on Albion Street in 2016. We know about these earlier shop locations from Sanborn Fire Insurance Maps (1883 to 1929). They were small buildings tucked between hotels, stores and saloons, and they were all found on Main Street near one of the hotels, except for Wells’ on Ukiah Street. The 1883 map notes a cobbler next to the Alhambra Hotel, once situated a few doors west of the Kelley Pond, and there was a shop in that general location until at least 1898. Cobblers carried on their business on the south side of Main Street in a building opposite Wilson’s Hotel and Jarvis & Nichols, and at another location a short distance away and across from Central House (later Mendocino Hotel). None of these cobbler buildings remain today. Lastly, I want you to know that the word “lasting” is a word shoemakers use to describe the process of pulling the upper part of the shoe over the “last” or mechanical shoe form before attaching it to the sole. You are invited to learn more about real shoemaking at the upcoming “Sunday Afternoon With the Cobbler: Old Soles & Happy Feet” held Sunday afternoon, February 10, 2019, from 4:00-5:00 pm. Our modern day Mendocino shoemaker Jason Clapp will demonstrate the age-old art of making shoes, describe the method of creating custom cut-to-fit footwear and offer tips and tricks for maintaining a healthy relationship between your feet and footwear. Limited seating. Admission $7; $5 for museum members. Call 707/937-5791, or email info@kelleyhousemuseum.org for more information.